We all believe that no children’s television program will ever be as good as whatever we watched as a child. But anyone growing up in the 1990s or before can probably count on one hand the number of cartoon characters of color featured on the various networks of the time. Save for the occasional children’s cartoon that explicitly featured characters of color—like Fat Albert, WayneHead, or my personal favorite C Bear and Jamal—cartoons have largely been a place for mainstream white images to dominate, much like the rest of American media. Occasionally, a show will feature a token minority character. For example, Susie Carmichael on Rugrats, Vince LaSalle on Recess, and the entire immigrant/poor/confused lot of Hey Arnold. But even in cartoons where race was supposed to be “non-existent,” it was obvious that the main characters were white— like the Funnies on Doug, or the titular character of Pepper Ann. This lack of minority representation persists despite the fact that, as discussed on social media recently, #RepresentationMatters. Early childhood influences leave an indelible mark on children. One of the greatest examples of this was shown in psychologists Kenneth and Mamie Clark’s famous “doll tests,” conducted in the 1940s, which showed both black and white children’s racial bias for white dolls, as they were associated with goodness and beauty. Thankfully, today’s children have a few shows that feature a central, leading character of color. For example, Disney Junior’s Doc McStuffins, which is centered around a little Black girl, and reaches almost a million viewers in the target 2-5 years old demographic. But of course, the real icing on the cake is the choice to have Doc not only be a Black girl, but a positive representation of one as well. 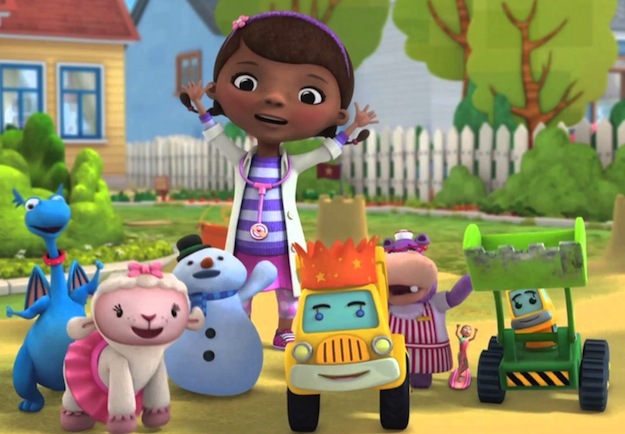 To reiterate the hashtag started by Jamilah Lemieux last week, #ThankYouDocMcStuffins for providing children’s programming that reflects a fun and attainable reality for young Black girls that they can connect with, while also showcasing a fuller range of reality to other children. For young Black girls, this ability to identify with Doc is key. The media consistently fails to showcase positive portrayals of Black girls and women. While we have celebrated the recent upswing in diverse representations of Black women on screen, it must be acknowledged that this trend is still pretty recent and new. Furthermore, the landscape in children’s programming is markedly different. While Black women celebrate the Cookie Lyon’s and Mary Jane Paul’s, it would be a little rough to have a 4-year-old look up to these characters. For a Black girl to take center stage in a cartoon and be shown as an intelligent, compassionate leader with a stable and supportive family allows the Black girls who watch Doc McStuffins to identify with someone who is similar to them, and the people they interact with the most. Seeing your image reflected back at you is a validation of your worth, something that is incredibly important at a young age. It is a boost to children’s self-confidence and self-esteem, which will continue to impact their future accomplishments for the rest of their lives. Doc gives Black girls the opportunity and desire to choose themselves in the images they see in the media..
Not only is this a benefit for those who watch the show, but it has also made the show a financial success! In 2013, sales for Doc McStuffins content and products crossed the $500 million mark. Not only are Black girls choosing themselves, but others are choosing them too. This positive representation of black girls is good for all children in general. Young black boys, as well as children of other races, need to have positive associations with black womanhood. There needs to be an understanding that not only do black women exist, but they can possess positive qualities that you would want your child to seek out. This is reinforcement of the idea that, yes, a black woman can be a doctor. She can be smart. She can be kind. She can be important. She can be many things other than a maid, mammy, or hyper-sexualized being. Doc, her family, and her friends in her imaginary world are a welcome addition to a television landscape where children should be taught that people of all backgrounds hold a place of significance in this world. And while media should be careful of blindly showcasing a “perfect” world free of intolerance, hate, or discrimination, a children’s show that features positive representations of a family of color is the right place to begin shifting bigoted minds. So let us all continue to be healed by Doc McStuffins.